2. Using a blender or hand held mixer, mix smashed Oreos and cream cheese together. 3. Roll into walnut size balls. 5. Melt approximately 3/4 package of white almond bark. 6. 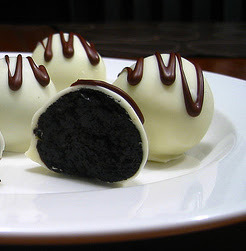 Stick a toothpick in an Oreo ball and dip it in the melted white almond bark. 7. Allow to harden on wax paper. 8. Takes about 15 min. 9. While waiting, melt about 1/4 package of chocolate almond bark. 10. When Oreo balls are no longer sticky to the touch, decorate with drizzles of chocolate and white almond bark. 11. I just use a sandwich bag with a tiny hole cut in one corner to drizzle the almond bark. Makes about 40 Oreo Balls.